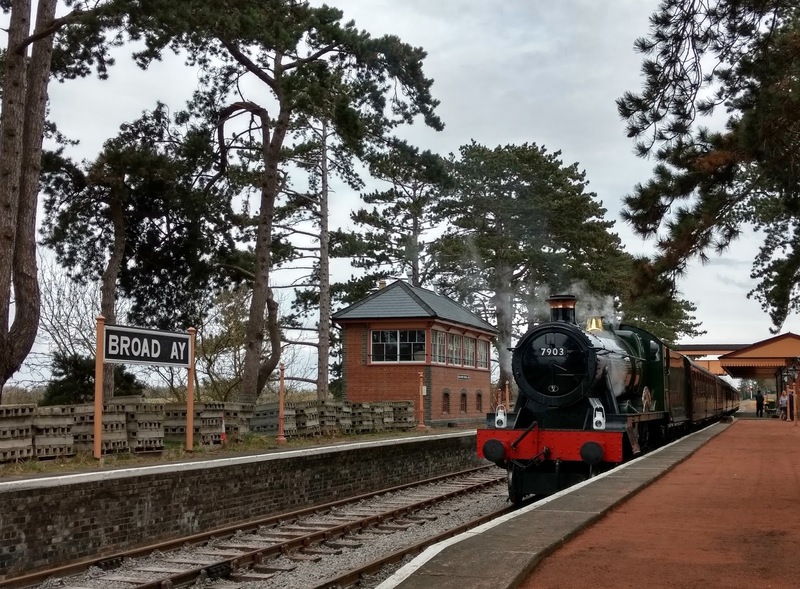 Today saw the first steam hauled train pull into our new station at Broadway. The loco selected was our widest - 7903 Foremarke Hall - and with it came 8 Mk1 carriages, our new train length following opening of the extension. The purpose of the run into Broadway was to test the line and the gauge within the station. 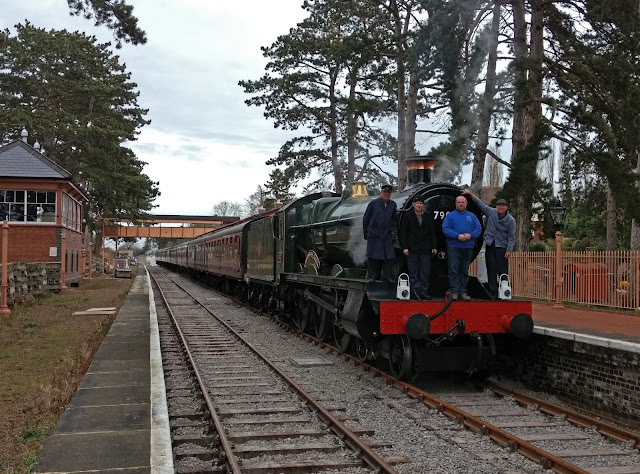 In only 12 days from now we will be running real trains with real people (2 days of volunteer specials, prior to the first public train on 30th March) so it is useful to just send along an ECS train to make sure all is well. It was, of course. Your blogger had to switch between camera and video mode, so in this picture the train has just rolled to a stop. The train lengthened to 8 coaches is very impressive. If we manage to fill that regularly, we should be able to generate some useful cash flow. There are so many things in which we need to invest. The train halted first at the southern end of the platform, and then proceded slowly through P1 while clearances were carefully surveyed. There were no incidents to report, which is great. The loco then detached (little puff of steam) and then ran round using the crossover at the north end. The ballast train was stabled in the headshunt as well, there is a useful amount of room there now. Foremarke Hall then ran round, and a member of the crew checked the clearances along this platform as well. If you look carefully you can see how the cylinder is the widest part. 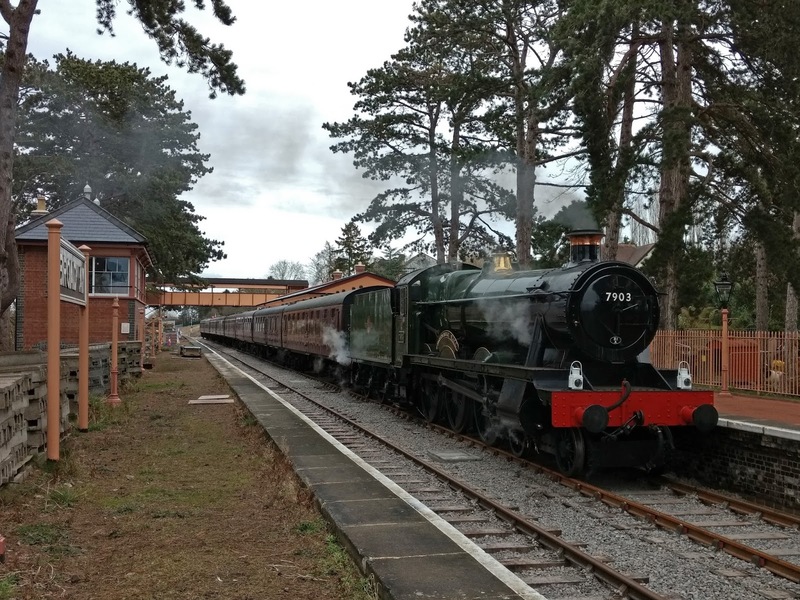 Here is 7903 Foremarke Hall slowly making its way past the Signal box. It seems a century ago that we laid the first row of blues here, and propped up the locking room door frame at one end. In the distance a select reception committee is waiting for the loco to reappear from behind its train. The loco then ran to the southern turnout, whose recently installed levers were ceremoniously pulled to reverse the points, and then she rumbled back over the bridge. And there we go, the first steamer into new old Broadway. A lot of water has flowed under the bridge to get to this moment. Tens of thousands of reclaimed bricks, all cleaned individually, to build the platforms, perhaps 70.000 of them? 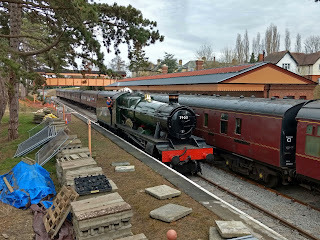 3500 hot rivets to build the precise replica canopy, the miracle of finding a near identical footbridge, replica lamp post castings, DIY spearhead fencing, bullhead track on wooden sleepers. Most of this was made possible only by the contributions of those who bought shares, or sponsored small, individual projects to beautify the station. We say thank you ! Now look at what you have achieved. 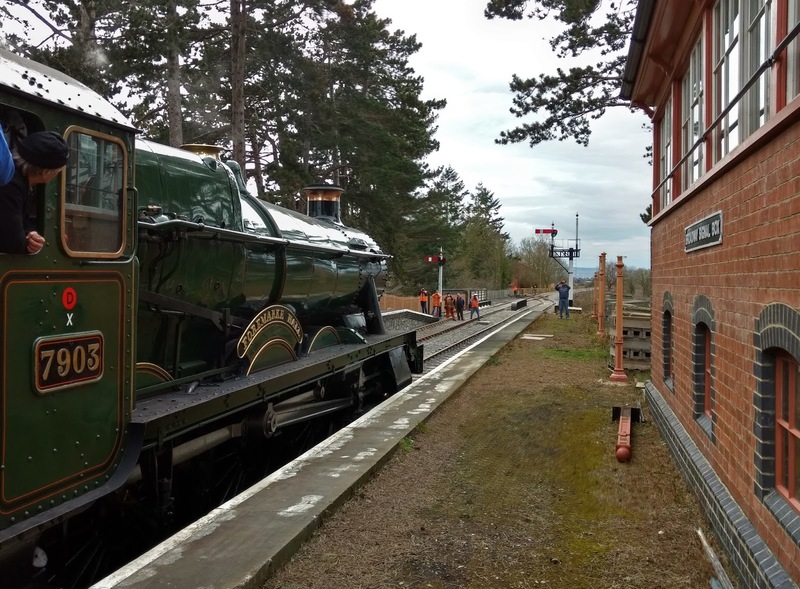 Here is Foremarke Hall resting briefly in front of the running in board and the replica signal box of Shirley, further up the N. Warwickshire line. The loco crew are off on a short guided tour of the station - what do you think of it so far? They liked it very much. A final posing picture of the loco crew. We called them out of their cab, please stand on the buffer beam so that we can record this, and they said, OK then. There will be two films of the event on YouTube, one of the arrival and one of the departure. Saturday: Back to work as normal! Sometimes we has fun, sometimes we just works. Huge congratulations to every single person involved! You've done an amazing job, and I hope you're all very proud. After all the sweat, snow and frustrations. Well done everyone. A fantastic sight. Well done to all concerned. An unexpected event, even though you told us to expect it sometime soon. Well, this is sooner than I expected ! And it's a wonderful, wonderful sight. Foremarke Hall looks resplendent. And with a real train ! In Broadway Station ! It's been worth the wait to see it. Thank you very, very much. Good luck with the turnout at Toddington tomorrow. And thank you again. Good fortune and good health, everyone. What a wonderful sight. 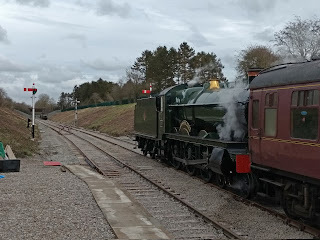 A GWR engine on 8 BR mark 1's. We forgive the unofficial class 1 headcode, it looks the part! Did Pete Waterman get in on this, or is he joining in the festivities later on? Well done to all, past, present and some deceased who helped to get Broadway to this stage. To be a little pedantic, 7903 was never a GWR loco, having been built in 1949 at Swindon under British Railways ownership. I concur totally with your last sentence. Nice to think that Foremark Hall was still languishing at Barry the last time a steam loco passed through Broadway in the mid 1970s! On Easter weekend perhaps the station staff can re-enact the photograph from 1904 of the then staff, taken from the track bed. It'd be a great addition to the booking hall if the two photos were displayed adjacent to one another! Sitting in the Loco Cabin in the corner of the Goods Shed at Toddington and talking about going North when we were only running to Gretton Meadow in the early 1990's was just a distant dream. Well dreams do come true and we have reached Broadway. A tribute to all that have struggled for so long to achieve this aim. And the next pipe dream ? 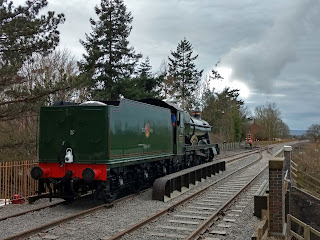 Running a set of Pullmans off the main line at Honeybourne right through to Cheltenham Racecourse, I guess anything is possible, one day. 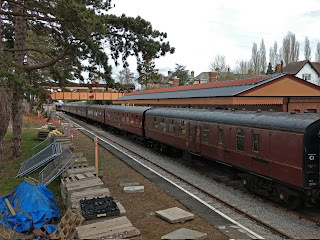 Honeybourne is a pipe dream as the GWSR doesn't currently own the trackbed from Broadway, but I also remember being told that the GWSR would never reach Winchcombe. So perhaps the call should be, Just give us money, money, money! Today, however, marks a serious milestone, with more to come. Many many congratulations to everyone involved in this magnificent achievement. Truly wonderful. Bit of an old tear in the eye again, well done lads, well done. Jo - thank you so much for doing the blogs for those of us that live along way away, I've been following them for 4 or 5 years now and I've really looked forward to my Friday night catch up. The effort really is appreciated.Fantastic accomplishment. I can have a can of something interesting now to celebrate..
A can of something ? !! I presume you mean beer. Well, that's nice of course. But to mark an occasion like this ! My dear sir !! I had a half bottle of vintage Moet et Chandon. And when the first real trains run,( I mean with people on board), I'll make it a bottle. Yes I should have something more celebratory when the first passenger service runs. I usually have a can of.. something interesting. .most Fridays anyway. David, I suggest you have a look on line at Sainsbury's website. They sell their own label champagne at a very reasonable price (if you like champagne, that is)) No it's not prosecco, or anything like that. It's the genuine article from Champagne, France. I recommend it ! 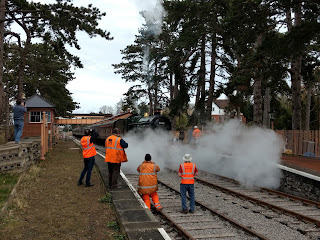 Here's to the brave men of the GWSR. You are all heroes. Our tickets for the 30th have been purchased. Thanks for bringing a distant dream to life. Well done! Look forward to seeing you on Friday. Jo, Thanks for the great news. I liked the videos, particularly the departing one - you were lucky with the wind - almost no wind noise today on the recording - but a fabulous whistle on the Foremarke Hall captured! 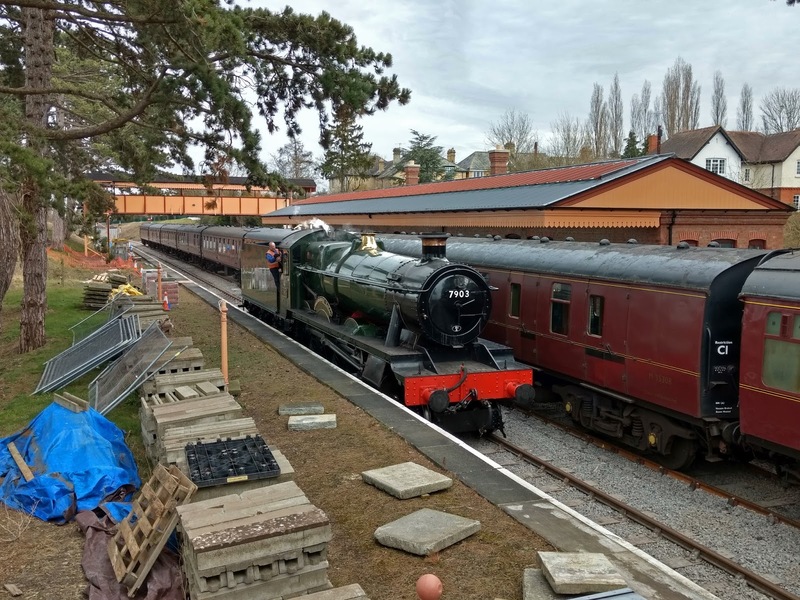 This is one of those moments in heritage railway history that will live long in the memory, and one I know you are all very proud. Thank you Jo for bringing this story to us all, It's a good indication of the ardent following of this blog, when you get fifteen comments in the space of four hours on a day when you don't usually post anything, there's tens of thousands of us out here following this week after week, and this is one of the magic moments in this wonderful story. Well done Chris Bristow, Alan Bielby, Colin Fewell, Richard Johnson, Lee Alibone, Glyn Cornish, Richard Summers, all the Bag team, John Crawford and all the many fantastic volunteers. So very well done to you all, an achievement that will bring joy to generations! Hear hear! Whilst the "ordinary" workforce are recognised on our collection of blogs regularly, directors deserve a lot of credit for all the hard behind the scenes work they do; too often all they get for their efforts are the world and his dog lambasting them over some part they're not completely happy with. Fantastic achievement, you should all be very proud of yourselves. Can't wait until Good Friday, I have tickets! Echoing everything above, didn't it just strike you, how right it looked? A Hall, 8 Mk1s, and, all of a sudden, the station is complete. All the photos over the last several years, from when the platforms were completed, have shouted Railway Station to me. The track going in made the last but one piece of the jigsaw. Today, the jigsaw was completed. Nothing announces your presence, and your serious intent, more than an immaculate Hall and eight passenger coaches in your station. The railway is back in Broadway, thenks to all of you. Congratulations to everyone involved in this project. Have followed the blog as shareholder right from the very start. Foremark Hall and its train looks so right. Looking forward to being there at the Easter opening. Superb achievement! To avoid the endless debates about it in twenty years time, when you're all sitting round the fire in Broadway station tea room... who was the chap in orange jumping off the footplate when the locomotive reached the start of the platform? Arguably the first person to alight a passenger train since reinstatement, certainly the first to alight from steam. That'll be a claim to fame for someone! No way will the tea room be finished in May 2018! I'm sure that work will continue so that it is open as soon as practically possible though. Toddington Ted is, of course, quite right. Legally, the GWSR have many requirements with which they must comply, under modern regulations, in respect of food storage, kitchen hygiene, handling of foodstuffs, etc., which, unfortunately, is a time consuming process. I'm afraid there is more to opening a Refreshment Room than re-enacting fond memories of "Brief Encounter" (1945), with Celia Johnson staring soulfully across the table at Trevor Howard, in the Refreshment Room at "Milford Junction", while Joyce Carey presides magnificently over the tea urn and Bath buns (freshly baked this morning), to the accompaniment of Eileen Joyce's positively tear jerking rendition of Rachmaninov's Second Piano Concerto. It's a wonderful reminiscence, I know, but not likely to happen quite yet. Yes, I agree it's a shame, but there it is. We'll have to be patient a little while longer . . . I hope no one is offended by my saying this. I suppose it may sound a bit sarcastic, but it is not meant to be offensive. Please excuse an old man. Difficult to find anything new or better to say other than to agree with previous posts. I add my thanks, heartiest congratulations and profound admiration. Everything you have done will be a long lasting testament to all your dedication, skill, enthusiasm and attention to detail. Your efforts will bring happiness to countless people for many years to come. I bow to you, one and all. Richard. I bet a few eyebrows were raised along the route near to the roadway. The surprise of seeing the Hall and a rake of 8 bogies (carriages) must have almost been enough to make some car (and white van) drivers nearly leave the road. I am only glad that no high vehicle got stuck under the Station Road bridge with the surprise! I must admit that if were walking, I would have had to stop and watch the train go by - like we used to many years ago. OMG,it did happen and I missed it! So like Peter Wright a half bottle of champers tonight to toast you all! Jo, another feather in your cap for this report, many many thanks. To all those past and present who made this possible well done, a volunteer group with a "can do" attitude that has done it! Don't let this moment pass, press releases to all the world! What an amazing site to see Foremarke Hall, red coaches, a proper length train arriving into Broadway and departing, AM MAZE ING!!! Got to admit a very moist eye at the moment of writing!!! We have our tickets for Easter now just cannot keep ourselves contained until then, so much excitement! Again well done to all concerned. This is a fantastic achievement so massive congratulations and huge thanks to everyone who has made this dream happen. We wanted to be there for the opening weekend but cant make it. Will be there soon though. If this doesn't get a top heritage award in the next round I'll eat my hat. More power to your elbow GWR. I hope that Earnest Marples and his pal Richard are turning in their graves!! Congratulations to all concerned! As has been said, it looks so right, and I'm looking forward to making the journey some time this summer!